I totally got yelled at this weekend. But, before I get into that – Did you take me up on the challenge last week? Did you put anything up for sale on Ebay, Craigslist, or hold a tag sale? How much did you make? This was after I deeply discounted everything so it would move. I’m pretty excited to say the least. I can’t wait to see what sells over the next few weeks. I plan on using this money to make some updates to my website. For me, it’s win-win. CLEAR™ some junk out of my house and invest in my business! I know you want to hear about how I got yelled at. Well, it all started last week with a phone call from my landlord. Nope. She didn’t yell at me. She called up to ask if the plantings in the yard needed to be watered and proceeded to tell me how much she was looking forward to seeing this year’s planters. You see, every year, I plant a few planters around the place. I’ve blogged about it HERE. In CLEAR™, I talk about surrounding yourself with beauty. A touch of beauty goes a long way in increasing our overall wellness. My planters act as a bridge to my community. I love the creative outlet they provide me and my community enjoys them as well. A get a lot of compliments from my neighbors as they walk by while I’m watering and it’s a way we connect that I wouldn’t otherwise have. So when my landlord said she couldn’t wait to see the flowers, I cringed a little bit because I was reluctant to admit- I hadn’t planted anything yet. Here in the Northeast, the rule of thumb is to plant after Mother’s Day to avoid frost. Well, Mother’s Day came, went, and I still hadn’t done anything. Oopsie. I don’t really have an excuse except to say- I was feeling a bit lazy about it. But, after the call, I was like- Annick, get it together girlfriend! Time to put a hustle in the shuffle and get some beauty going. A few days later, I was wheeling one of those carts along the the rows of flowers at my local garden center. It was HOT. I was over dressed, sweating, thirsty, and completely overwhelmed by the sheer amount of flower options. Hmmm… Should I do pink? No. Maybe yellow and blue…. No. How about those purple potato vines? Nah. Been there, done that… Ugh, I don’t know what I want…. We all started laughing together. They were right. I was stressing. Sometimes, the universe sends you a message you can’t ignore. In this case, the universe was straight up telling me to knock it off and have fun. Oh yeah. I forgot about that thing called fun. After all, I had some serious business to attend to. The pressure to make my planters perfect! To up the ante and make them better than last year! Really?! Its amazing how much pressure we put on ourselves. And for what?! So, I laughed and laughed at myself. Then, I said- screw it. I’m gonna have fun. I went completely against my own grain. Usually, I pick out modern plantings. You can see past years HERE. Instead, this year I decided to pick some plants I consider old lady specials like Geraniums and I chose a color I have never done before- RED with white. I made this decision based on these petunias I found that remind me of a circus tent with their stripes. I thought, if I’m going to have fun I might as well make it silly and showy! When I was done planting the planters, I stood back and admired my work. It felt good to dig in the dirt and take in the bright reds. These flowers make me happy and I chuckle when I think of those two ladies calling me out while I stood sweating- literally – over my decision. 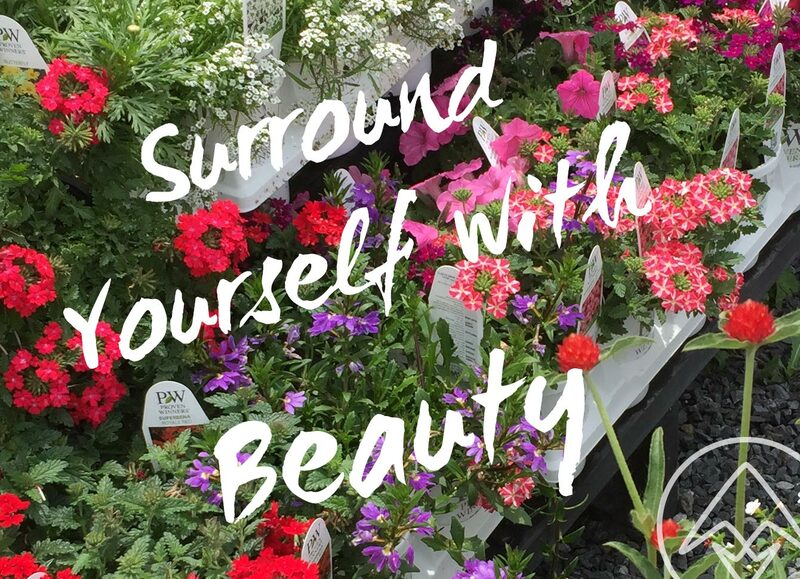 Surrounding yourself with beauty doesn’t need to be hard or overcomplicated. Sometimes, the simplest decision to just allow fun into your life can make it happen. If you liked this post, please share and join the CLEAR™ Inner Circle above!